Hello faithful readers who have saved willkuhn.com on your RSS feed reader. I am back. I have come down from the mountaintop, and in my hand I hold an amazing tablet. But let’s skip all the magic and head right over to the music apps. 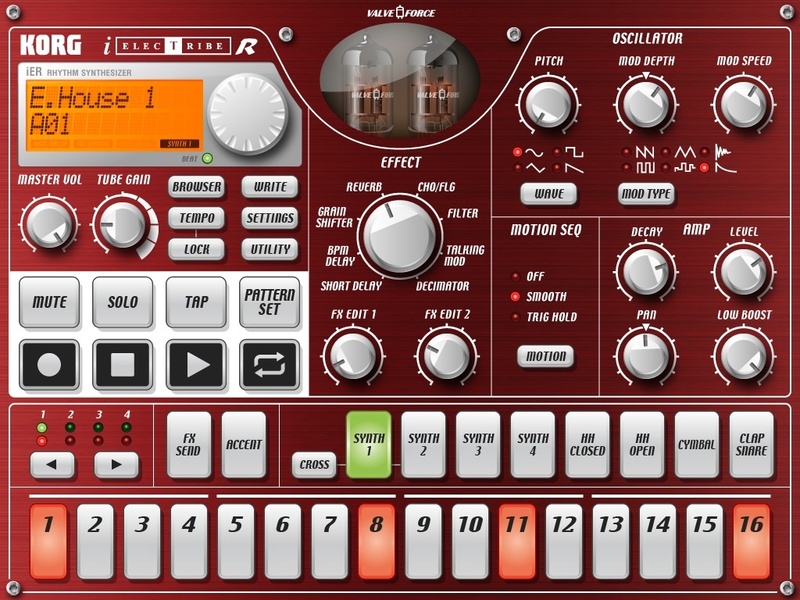 For my first look at an iPad music app I’ll take a look at Korg’s iElectribe drum machine, a faithful recreation of their Electribe drum machine of not-so-many years past. So we have the standard 16 switches for timing, eight sound bank slots, a “transport” area, and a pretty sophisticated effects area. The “browser” button takes you to the preset sound banks, which do not appear to be editable, and also shows you the preloaded beats, which are of course editable. I wish that Korg would have make the INIT patches a little more accessible than throwing them down all the way at the bottom of this list, but at least there are many blank slots to mess with. What sets this drum machine apart from many other iPhone/iPad 808-alikes is its ability to record knob turns in realtime. Simply hit the record button, and along with saving all of your pad triggers (and doing some auto-quantizing magic) it will auto-record every knob you turn in the effect section as well. This has its pros and cons, however, as it can be frustrating to think you’re changing the effect, only to have it change back on the next loop through. Once you realize what’s happening, it’s easy to fix, but the effect can be a bit jarring. The last problem with this app is its inability to export the great sounding drum loops it creates. There is simply no way to get a wav or aiff or anything out of this app outside of hooking it to a line-in jack on something else, which kind of devalues the possibility of using the iPad as a standalone music making device. I’d love to dream up some loops in iElectribe and then export them to Looptastic (more on Looptastic later). EDIT: a new version of iElectribe allows loop and performance exporting via iTunes file sharing. Woo hoo!